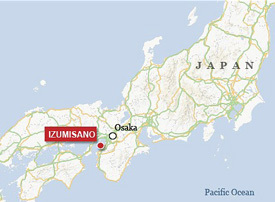 The Japanese city of Izumisano is offering to rename itself after the highest bidder to help with its crippling debts. The city in the western prefecture of Osaka – currently called Izumisano – owes its creditors well over 100 billion yen ($1.2 billion), the official said, adding the presence of nearby Kansai International Airport was partly to blame. “The city spent a lot of money building roads and other infrastructure because the airport was built in this relatively remote place,” he said on condition of anonymity. Izumisano, which is known mainly for its towel-making industry and proximity to the airport, is looking for a sponsor prepared to stump up at least a billion yen ($1.2 million). Suitors will also need to sign a ten-year contract affirming a connection with the city, for example by moving their headquarters there. Officials originally announced the plan in June but had no takers, the official said, adding so far the bulk of inquiries had been from some of the city’s 103,000 residents annoyed about the plan. Many of Japan’s regional governments are saddled with enormous debts after decades of infrastructure projects of sometimes dubious value. A rapidly ageing society means an increasing number of [senior citizens] need to be supported by a dwindling workforce and a shrinking tax base. Bids for a new name for Izumisano will be accepted until November 30, the official said. India’s taxman has finally caught up with the nation’s working elephants, with the owners of those working at temples, festivals or parties having to pay 12 per cent of their earnings in service tax. In India’s autumn wedding season the number of ceremonial elephants can being city roads to a standstill. Elephants are deployed throughout India as ceremonial beasts at weddings, Hindu festivals and as exotic children’s rides at birthday parties. For many they are an affordable treat – toy shops offer them for under [$40] per hire as an upgrade on a party camel. During peak demand, the going rate can rise to around [$480] per day. Now the Indian revenue authorities want their share and have ordered all enterprises hiring out elephants to levy a 12.36 per cent service tax. Moscow is reclaiming bragging rights for having Europe’s tallest building after losing the distinction for a few months to London’s Shard. 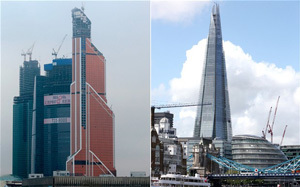 The tower, sheathed in copper-coloured glass, actually became Europe’s tallest in September, while still under construction, when it exceeded London’s 310-meter (1,017-foot) Shard, according to the construction information company Emporis. Mercury City’s reign is likely to be almost as short. It’s next-door to the under-construction Federation Tower, which is to reach 506 meters (1,660 feet) when it’s completed next year. Both are in a sprawling development called Moscow City that also holds two other buildings that once were Europe’s tallest. The complex is an eye-catching demonstration of Moscow’s transformation from drab shabbiness to swaggering prosperity, driven largely by oil and natural gas revenues. Mercury City “distinctly shows the activity of Russian business … it demonstrates that all of Russia is on a level with countries of the eurozone, continuing its planned development and moving forward,” Igor Kesayev, director of the Mercury company, was quoted as saying by the news agency Interfax. But competing with European countries for tallest building is playing in the minor leagues. There are nearly 60 buildings in North America, Asia and the Middle East that are taller, topped by Dubai’s Burj Khalifa – about 2.5 times taller than Mercury city at 828 meters (2,717 feet).